Working on a project recently I found the need to determine the master catalog for a list of stores within a WebSphere Commerce database. 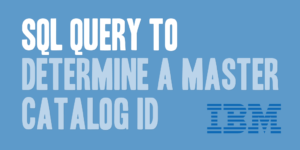 Seeing as a WebSphere Commerce instance can contain a variety of stores, ranging from your traditional Consumer Direct model to a more extensible Extended Site model, I generated the following query which can be run against the WebSphere Commerce database to properly determine the master catalog identifier for each store. 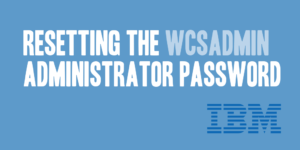 The following SQL statements can be used to reset the default “wcsadmin” account password on a developer’s toolkit, back to its default value of “wcsadmin”, assuming the following criteria have been met. 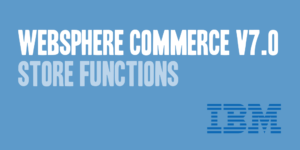 This post builds upon a previous post, WebSphere Commerce v7.0 Store Functions, and goes into the checking the status of enabled or disabled store functions within your Java code. 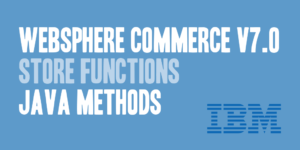 WebSphere Commerce v7.0 Feature Pack 2 introduced a new way to handle change flows, now referred to as store functions. For those not familiar with store functions, a store function is basically a way to handle and control pieces of your pages and/or logic from display or execution based upon the availability of the feature within your store. On my last post, Create and Enable Aurora Page Layouts in WebSphere Commerce, I left the last step in that tutorial to be completed through the use of Management Center by business users. 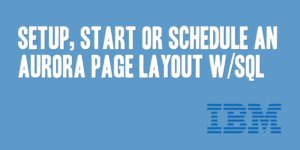 As there are sometimes where it’s entirely a techie responsibility, I wanted to follow that post up with the actual SQL used to setup and schedule that newly created page layout to the actual WebSphere Commerce page. Stay up-to-date and always receive the latest tips, tricks, guides, tutorials, and programming helps to your inbox! Copyright © 2019 @daharveyjr. All rights reserved.